Whichever delivery option you choose, please ensure that your email will accept mail from admin@goldenroot365.com as a few customers have found that our order confirmation and despatch notifications have been blocked by their spam filters. Please also note: We trade under the name Natural Portfolio Ltd for your banking discretion. Same day despatch on orders placed before 4pm Monday to Friday: Orders placed after this time are despatched the next working day. Please note: We do not despatch over the weekend or on bank holidays. Please ensure all banking details are correct when placing an order to avoid despatch delays due to the bank card security checks. 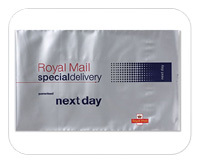 £2.25p UK ROYAL MAIL 2nd Class - 2-5 Days - This is offered to all orders in the UK. This service is standard 2nd class mail without tracking or insurance. Only suitable for small orders able to go through a letterbox. If you do choose this option, we cannot refund/ replaced a lost item for 30 day's or once Royal Mail have carried out their investigations. We can send out a replacement parcel after 30 days. We only refund on the missing goods not the postage as we have already incurred the royal mail postage costs. INCLUDES: Proof of posting, signature on delivery and online confirmation of delivery. If not delivered or lost will send out a replacement parcel after 15 days. Traceable - We will only get info once the item has had an attempted delivery. £15.00 INTERNATIONAL ROYAL MAIL TRACKED & SIGNED (EUROPE) Approximately 7-10 working days but may be quicker. £18.00 INTERNATIONAL ROYAL MAIL TRACKED AND SIGNED (NON-EUROPEAN COUNTRIES) Approximately 7-10 working days delivery but may be quicker. INCLUDES: Guaranteed Next Day delivery on orders placed before 4pm weekdays. Guaranteed delivery week days only. Online tracking and electronic proof of Delivery. If not delivered or lost we will send out a replacement parcel after 72 hrs. INCLUDES: Guaranteed Next Day 9am delivery on orders placed before 4pm on the previous day. Online tracking and electronic proof of Delivery. If not delivered or lost we will send out a replacement parcel after 72 hrs. INCLUDES: Guaranteed Saturday delivery on orders placed before 1pm on the Friday. Online tracking and electronic proof of Delivery. If not delivered or lost we will send out a replacement parcel after 72 hrs. Trackable - We will only get info once the item has had an attempted delivery. For Europe and Worldwide we use a SIGNED FOR COURIER door to door with full tracking facility. Depending on your location, size and weight of your parcel, we will choose which is best for you, OUR PREFERRED OPTION IS UPS. Delivery times to the EU are 3-5 day's, the rest of the world inc Asia, Asia-Pacific and Nth America delivery times 7-10 day's. Algeria, Afghanistan, Azerbaijan, Bahrain, Bangladesh, Brunei, Burkino-Faso, Chad, Comoros, Djibouti, Dubai, Egypt, Eritrea, Ethiopia, Guinea, Indonesia, Iran, Iraq, Jordan, Kazakhstan, Kosovo, Kuwait, Kyrgyzstan, Lebenon, Libya, Mali, Malaysia, Maldives, Mauritania, Morocco, Niger, Nigeria, Oman, Pakistan, Palestine, Qatar, Saudi Arabia, Senegal, Sierra Leone, Somalia, Sudan, Syria, Tajikistan, The Gambia, Tunisia, Turkey, Turmenistan, United Arab Emirates, Uzbekistan, Yemen.